UN - The World Food Programme today drew attention to the disappearance of three of its staff members who went missing earlier this month when fighting reportedly erupted along their food distribution route in volatile Malakal South Sudan, where more than 2 million people are unsure of where their next meal is coming from. According to WFP, their disappearance comes after another WFP staff member was abducted at gunpoint in October 2014 from the airport in Malakal in South Sudan and hasn’t been heard from since. WFP fears that worsening insecurity in some parts of South Sudan will make it harder for humanitarian agencies to reach conflict-affected communities with badly needed assistance, just as the lean season is set to begin. The three WFP staff members disappeared on April 1 en route to a food distribution in South Sudan’s Upper Nile state. They were traveling in a convoy from Malakal to Melut, carrying food intended for thousands of conflict-affected people, when witnesses say intercommunal fighting erupted along the road on which they were traveling. WFP lost contact with the three men and has not heard from them since, despite intense efforts to reach them. The agency also noted that because of increasing concerns about staff safety, it is re-assessing its ability to work in some parts of Upper Nile state. According to the press release, WFP plans to temporarily reduce its operations in those areas where it no longer believes it’s safe to work. The UN says that 10 humanitarian workers have been killed in Upper Nile state since the start of South Sudan’s conflict more than 16 months ago. According to WFP, 2.5 million people in South Sudan started this year unsure of where their next meal is coming from. Food security analysts believe this number will increase with the start of the lean season in May. WFP aims to assist roughly 3 million people throughout the country in 2015. 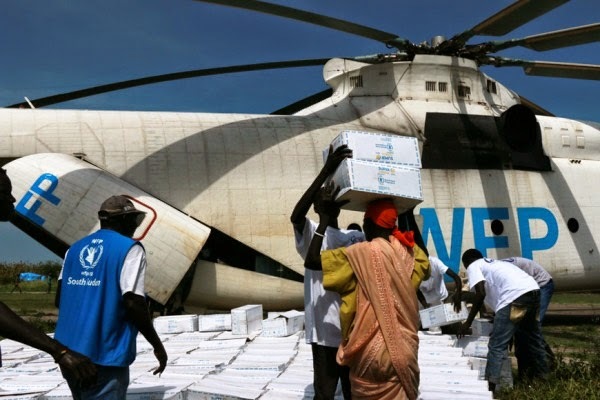 The WFP has raised its most recent concerns as the he UN Mission in South Sudan (UNMISS) reports that fighting erupted in Malakal on Tuesday evening and continued throughout most of the morning and early afternoon. The residence of the Upper Nile state governor was reportedly shelled by mortar rounds and two of his security officers were also wounded. At least 1,500 unarmed civilians have arrived at the UN protection site outside Malakal, which brings the total numbers of civilians being protected there to that particular site to 28,000 people.